Relate: I hate been having so much fun reading facebook the past couple days. Normally, I barely look at it, see my notifications, then hop off. But these days, I just like scrolling through my feed and smiling. You see, probably more than half my friends list are people from New York and PA. That means half of my news feed is pictures of shoveling and buried cars and blizzards and kids making snow caves and… It is so beautiful for me to see when I debate if I should go long sleeve or short. You see, I hate winter. I hate snow, and I am so glad I am not in blizzard Stella. It isn’t just winter that I don’t like. I hate snow. I’m also not a big fan of many of the trappings of Christmas. I’m definitely not a big fan of Christmas Trees. When I came home one day in late October… yes, October, to find my roommate had put one up, the first words out of my mouth were, “What is this abomination?” I hate snow. I the twisting of history and legends that surround the Christmas stories (both adult and children’s). The lights are a drain on the electric bills and an infringement on the peace and quiet of evenings with all their visual noise. However, I do love Christmas music… for about the first two hours that I hear it. Then I’ve had enough until next year. Keep me away from the glitter, the lights, the cold… did I mention I hate snow? After all that I should clarify that I do love Christmas. I know it wasn’t the true day He was born. I think the best argument for when He was born goes to late summer. Whenever it was, every day is Christmas, even in the middle of March when we only see snow in our social feed. I should remember that He is present in the world every day because He is living in me. If you have surrendered your life to Christ then He is living in you too. We are the living reality of the incarnation of Christ. React: I wonder what it would have been like to be Mary and Joseph. I wonder how it must have felt to hold the tiny fragile baby who is the very embodiment of God Himself. How hard must it have been for Joseph to reverence the Immanuel (God with us) as he changed another dirty diaper? Did they have a struggle between the heart knowing the greatness of the miracle Jesus represented and the mind trapped in the mundane drudgery that is part and parcel to humanity? Or is that only something I struggle with knowing, yet not fully comprehending that the God who has created the universe has set up His dwelling in me, and can do so in you as well. He has come… and He is still here. 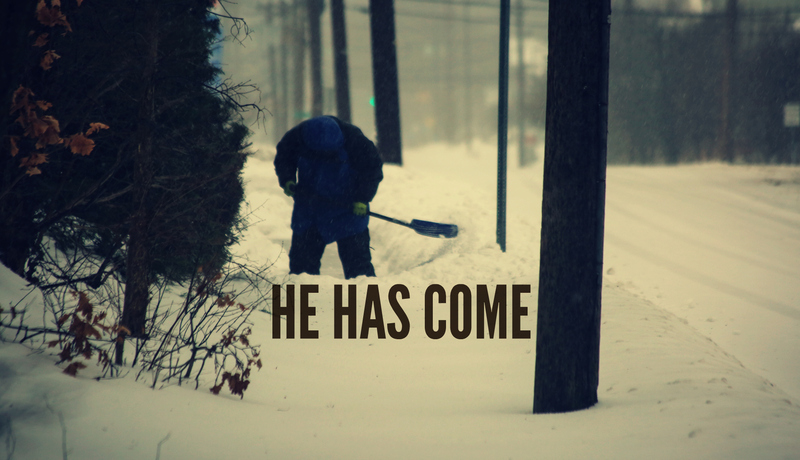 Even as you shovel another foot of snow that dropped this past hour, remember, He is here. Help me to never lose the wonder of the fact that You have come. You left the glory of heaven to be born in a barn and live through all the beauty and pain that this life has to offer. When days are good and the sun is shining, You know and share my joy. When the rains pour misery into my life You can truly empathize. Just as You stepped into this world and into my life help me to carry You to those who have not yet come to realize what an incarnate God can truly mean for them. I am so glad to be a follower of your blog. Your posts touch my heart with novel expressions of the grandeur of our Lord. Also I love your prayers. Yes, the Spirit of Christmas is one we can celebrate all year round. I hate cold. I hate snow. I hate the fantasy and commercial outlet Christmas has become. I hate “Santa.” I tire quickly of the “Baby Jesus” mentality that ignores the Cross. But I love the Holy Spirit Who makes every day a celebration of joy, peace, and goodwill. Loving this album Garden by Kari Jobe too! He has come. So let Him reign. And I hate winter and snow, and the lies that come with Christmas too. Hehe. Made me laugh but still touched my soul!